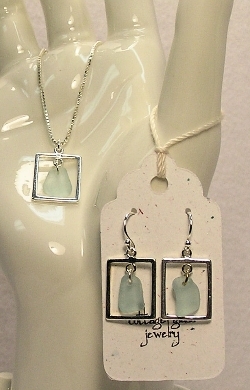 A rare light aqua piece of beach glass collected from a Lake Erie beach dangling in a sterling silver square, hanging from a 16" box sterling silver chain. Simple and elegant. Please note: this necklace will be made with a piece of beach glass approximate to the one shown - all pieces of found beach glass are unique.